As a fetus develops, the bones of the skull are flexible and sutures are not fused. This allows passage through the birth canal, which can cause flattening of the head. When a misshapen head needs correction, a baby might need to wear a cranial helmet, which is a device that reshapes the head as a baby grows. A cranial helmet is fitted by a specialist and is worn 23 hours a day for several months. 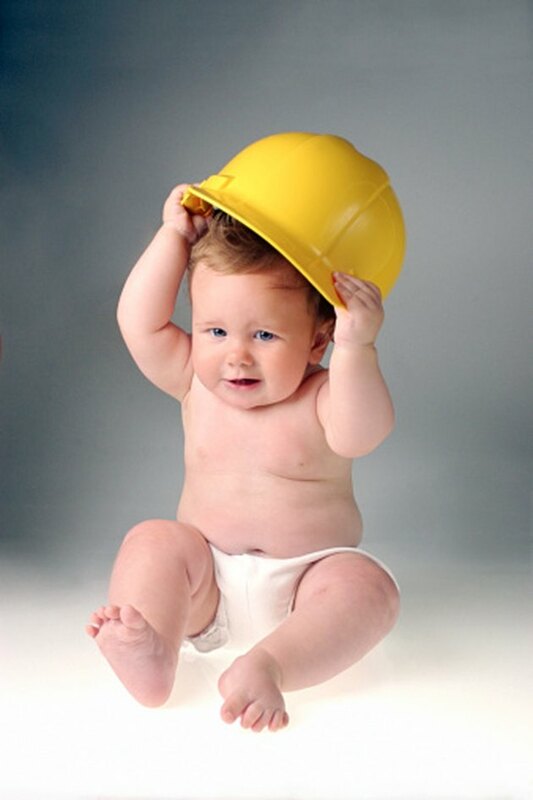 The optimal time to begin wearing a cranial helmet is between 3 and 6 months of age. The helmet must then be adjusted every one to two weeks as the shape of the head improves. Many reasons could explain why a baby's head is misshapen and requires a helmet. Plagiocephaly is a condition that causes flattening on one part of the head. Plagiocephaly has several causes. Some babies are born with the condition torticollis, which is a shortened muscle on one side of the neck. This can cause a child to turn her head frequently to the same side. When this occurs with sleeping, the repetition of sleeping on one side causes a flattening of the pliable bones of the skull. Plagiocephaly can also occur in premature infants who must be repositioned frequently. Infants who are sick could spend more time resting with their head turned in one direction, causing flattening. The condition can also occur in utero, particularly in a multiple gestation pregnancy, as one baby can push up against another, causing pressure on the skull. Brachycephaly occurs when the back of the head is flattened, producing a wider portion of the skull in the back than the front. This can by caused by craniosynostosis, a rare closure of the skull sutures before a baby has fully developed. The condition can also occur when parents repeatedly place their baby on his back to sleep, as recommended to reduce the risk of sudden infant death syndrome. Without adequate time in other sleeping positions or play time allowing a baby to lie on his tummy, the back of the head can be flattened and abnormally widened. Scaphocephaly, also called sagittal synostosis, is a condition in which the middle sutures of the skull are closed. This causes a high midline of the skull and the brain grows upward. In cases of closed sutures, a baby's brain will continue to grow toward the area where sutures are not fused. In scaphocephaly, the brain grows from back to front, producing an elongated head that could require a helmet for correction.